With some time to kill before my next stop - the 12:30 tour at the State Library, I headed off down Little Bourke and through Chinatown and its beautiful old buildings sitting alongside modern skyscrapers. I arrived to find the lawns out the front bathed in sunshine, so I pulled out the sandwich and apple I'd brought from home and ate my lunch in the Winter sun. My lunch date was well travelled, well read, but the strong silent type, so there wasn't a lot of conversation. I was happy enough to sit and people watch, anyway. I headed inside, grabbed a Library Highlights brochure from the information desk and headed for the top floor. The huge dome ceiling rises above the 6 storey hexagonal building that houses the LaTrobe Reading Room. 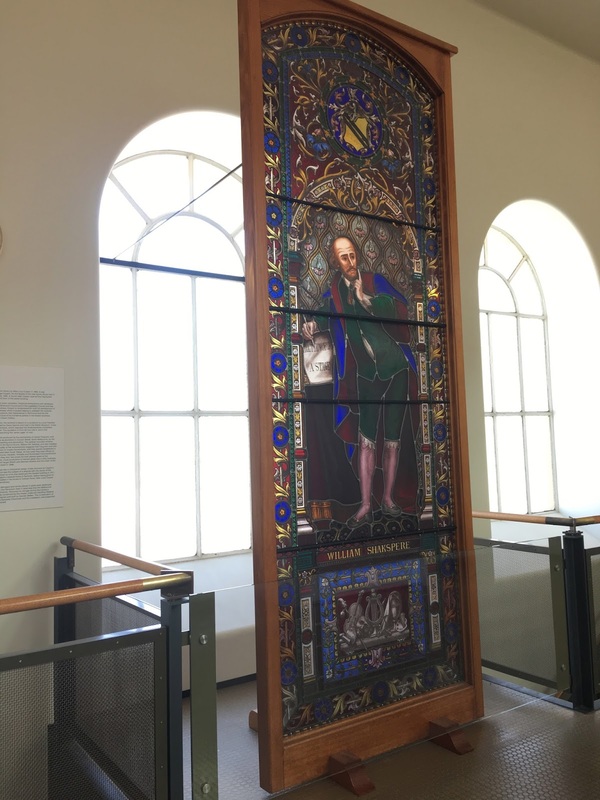 The 3 metre high Shakespeare Window, a stained glass beauty that sits inside the real arched windows. I watched a few people come out of the lift, go to the window to view the dome then go downstairs, completely oblivious to this gorgeous piece behind them. The floor is home to the fantastic exhibition, The Changing Face of Victoria. Photos, memorabilia and historic items showcasing our fabulous state. The Ned Kelly exhibit was excellent. A great display of letters, photographs and Ned's armour on display. I finished my solo exploration of the Library and joined a guided tour of the latest exhibition in the Keith Murdoch Gallery, Strutt's Australia. I hadn't heard of Strutt before, but came away from the exhibit with a new found admiration for the artist, whose work from a very early age showed his enormous talent. I especially loved his works featuring horses and his Australian scenes of bushrangers.